Boston University’s jazz and contemporary dance group, Edge, is having a fundraiser and holding auditions this week. The group performs at college showcases around the Boston area at MIT, BU, Northeastern, etc. The group is entirely student run and choreographed. 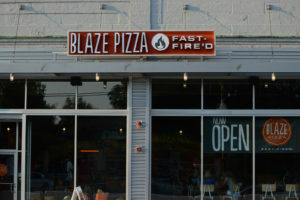 Head down to Blaze Pizza at 961 Commonwealth Ave. from 5-10 p.m., show the Facebook event banner and enjoy some pizza with friends while supporting a good cause. Local vendors gather in Copley Square every Tuesday and Thursday from 11 a.m. to 6 p.m. until November to create one of Boston’s busiest and biggest farmer’s markets. From cheese to vegetables, the market has something for everyone. It’s a great way to eat locally and support local businesses. This unique event is described as a “yard-sale-style event with a catch: all items come with their backstories.” On Wednesday at 5 p.m., head over to the Podcast Garage in Allston with clothes that you want to donate to a thrift store but you don’t want to get rid of because of the story behind it, or come prepared to hear stories about clothes from other people. It’s sure to be a fun and enlightening night, and all the proceeds will go to Hurricane Harvey relief efforts. This monthly event at the ISG features music, conversation and hands-on art making in the “enchanting” courtyard. This month’s theme is #ThrowbackThursday, with music and activities to take visitors back in time. Students can buy tickets for Thursday’s event online for only $5, or visit the ISG at any other time for free with BU’s university membership. The BU Arts Initiative is holding its third annual Fall Arts Fair this Friday. Head to the GSU on from 11 a.m. to 2 p.m. to check out organizations like Actors’ Shakespeare Project, the Boston Ballet, Harvard Art Museums, MASSCreative, Museum of Fine Arts, Boston and many more. This yearly event showcases 100 of Phantom’s favorite foods. This is an indoor and outdoor event that gathers foodies from all over to line the streets next to Fenway Park. Check out PhantomGourmetFoodFestival.com for more details. It takes place from 12 p.m. to 4 p.m. on Saturday. Head to Central Square in Cambridge this Sunday to eat as many dumplings as your heart desires. In honor of Joyce Chen, who is credited with popularizing Northern-style Chinese cuisine in the United States, 15 local restaurants and food trucks will be cooking up their variations on dumplings. Central Flea will also be hosting their regular market, which features antiques, vintage clothing and art.